That claim, uttered by Jane Greer as the devious Kathie Moffat in director Jacques Tourneur’s Out of the Past, is not entirely true. The character is an exercise in self-construction, spending much of the film behind an array of masks designed to please whichever man she is trying to manipulate at the time. But at heart, she is far from pleasing, for Kathie is undiluted feminine poison, crossing, double-crossing, and triple-crossing everyone unlucky enough to come into contact with her. By turns innocent and evil, virtuous and dishonest, she operates entirely without moral compass or conscience to guide her, and in the process she destroys not only herself, but all of the men in her orbit. She’s gorgeous. She’s appealing. And she’s very, very bad. By every definition, the quintessential femme fatale. Kathie lives fully in the shadows; the light is her enemy, illuminating her true character for all to see. The night, however, obscures things, hiding the truth. Indeed, it hid the truth about Kathie, up until the very moment she stepped into the light and shot a man to death. True, Kathie is not the only one who exists in the shadows, for Out of the Past is filled with characters who dwell in the darkest places, driven by the darkest motivations of human nature. But she is, by far, the character who thrives the most in those grim arenas. When first we meet Kathie, the audience–like Jeff (Robert Mitchum)–is unsure what to think. She certainly looks the innocent, dressed in pure white in the Mexican heat. Yes, she shot her gangster boyfriend, Whit (Kirk Douglas); she admits this outright, with no hesitation, before justifying her behavior due to “fear” of Whit’s controlling nature. She is a coy flirt, with all the guilelessness of an innocent, and as Jeff recalls, “she’d come along like school was out,” playing up her girlishness, running across the beach in bare feet. Even when he expresses doubt about her story, however, Jeff finds himself too enamored to turn her over to Whit: when she asks if he believes her story, he responds, “Baby, I don’t care,” before crushing his mouth to hers. The sexual pull between the two is far too strong; Jeff is ensnared in her web, and has no compunction about abandoning his job to run away with her. They flee to San Francisco, living lives at “the bottom of the barrel,” as Jeff puts it, and spending their days in hiding and their nights in the dark of movie houses and the like. When they become a little too comfortable and start venturing out into the light more and more, their cover is blown: Jeff’s former partner, Fisher, spots Jeff at a racetrack, and the couple’s idyllic, secretive life together is over. Arguably, the most effective scene in the film is the one in which Jeff–and by extension, the audience–learns Kathie’s true evil nature. When the lovebirds are confronted by Fisher in the remote mountain cabin, a fistfight breaks out between the men. The camera cuts between the brutal punches and Kathie, whose impassive face is periodically shrouded in the shadows cast by the brawling men; her eyes never turn away from the fight. But immediately after she puts an end to the fight by shooting Fisher point-blank, Kathie is bathed in light from head to toe, her motives hidden no more. 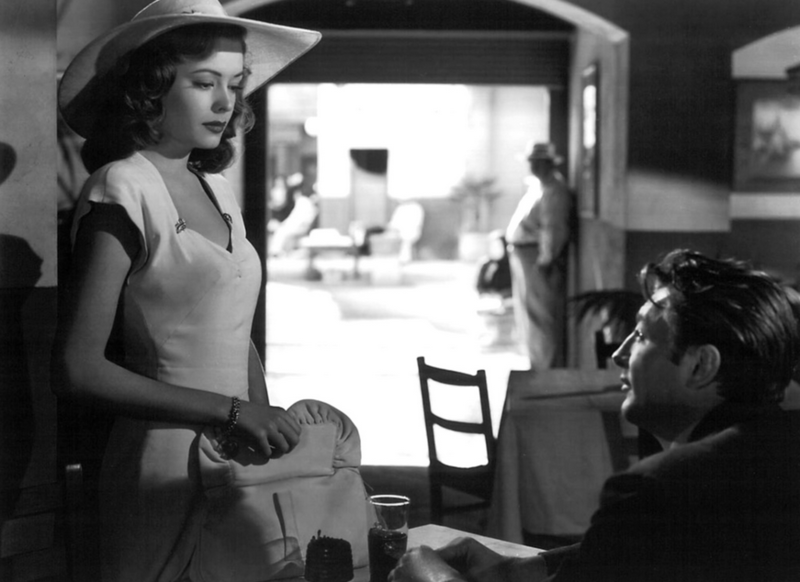 What Mitchum then does here is brilliant, as he stares at her first in abject horror, and then, with one up-and-down flicker of his eyes, takes in her entire frame as if seeing her for the first time; the sudden, heartbreaking wisdom of who he’s really dealing with is etched on his face. That lack of feeling on Jeff’s part adds to the cynical undercurrent of Out of the Past. It’s almost as if, on some level, he suspected that Kathie would eventually reveal her true colors, and in the end, he is resigned to what his past with her will cost him–it is the price he must pay for ignoring all the warning signs that were initially presented to him. There is a distinct air of hopelessness that surrounds the film, as Jeff realizes that, try as he might, there is no true escape for him, nor is there any way to reconcile his past misdeeds and have a happy future with Ann. The brief moments in which Jeff sees glimmers of hope are quickly dashed, and by the time Kathie asks him to leave with her, he already knows his own fate, and foreshadows it himself: “Well, build my gallows high, baby,” he intones to Kathie as she threatens to incriminate him for the trail of corpses that have been left in her wake. But as much as she purportedly wants to recapture their past glory days in Mexico, Kathie also makes sure that Jeff understands it will happen on her terms alone. She holds his future in her hands, and both of them know it. And it’s this arrogance that is ultimately Kathie’s undoing. So certain is she in her planning, in her control of Jeff, that she leaves the room long enough for him to call and report their route to the police in time to set up a roadblock, sealing both their fates. They lived by night, and it’s fitting that they died by night, too. Out of the Past is now available on a stunning Blu-ray presentation through Warner Archive. The disc also includes audio commentary from author and film noir expert James Ursini. True Classics thanks Warner Archive for providing a copy of this film for the purposes of this review.